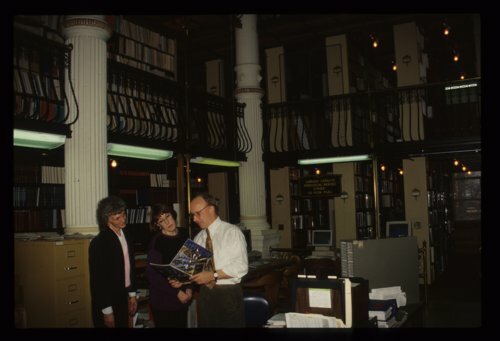 Here are two slides showing the State Library prior to being remodeled. The State Library is located on the third floor of the Kansas Capitol in Topeka, Kansas. Pictured in the first slide are Ruth Appelhanz, Cindy Roupe, and Marc Galbraith. The second slide shows the mezzanine of the library stacks from below.